Cohesion: Water is attracted to water. 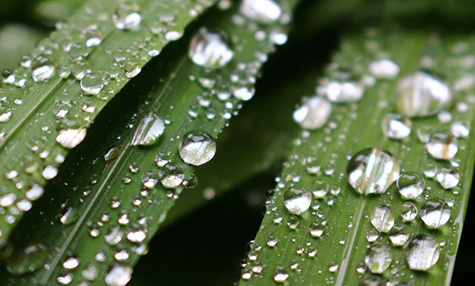 Observe the cohesive effects of water molecules permitting a drop of liquid to form on the leaf above and maintain a spherical shape that will roll on a surface without breaking apart. The lowest energy state for this drop occurs when the maximum number of water molecules are surrounded on all sides by other water molecules -- meaning that the drop should have the minimum possible surface area, which is a sphere. More precisely, the positive and negative charges of the hydrogen and oxygen atoms that make up water molecules makes them attracted to each other. What type of bond occurs between two water molecules? In a water molecule, the two hydrogen atoms aligmn themselves along one side of the oxygen atom, with the result being that the oxygen side has a slight negative charge and the side with the hydrogen atoms has a slight positive charge. Thus when the positive side on one water molecule comes near the negative side of another water molecule, they attract each other and form a bond called a hyrogen bond. Hydrogen bonds cause water to be highly attracted to each other. Therefore, water is very cohesive. See also: Why water is such a good solvent. Adhesion is the attraction of molecules of one kind for molecules of a different kind, and it can be quite strong for water, especially with other molecules bearing positive or negative charges. Chemical adhesion occurs when the surface atoms of two separate surfaces form ionic, covalent, or hydrogen bonds. 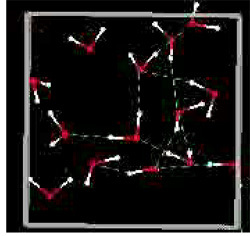 There is no single theory covering adhesion, and particular mechanisms are specific to particular material scenarios. For instance, adhesion enables water to “climb” upwards through thin glass tubes (called capillary tubes) placed in a beaker of water. This upward motion against gravity, known as capillary action, depends on the attraction between water molecules and the glass walls of the tube (adhesion), as well as on interactions between water molecules (cohesion). The water molecules are more strongly attracted to the glass than they are to other water molecules (because glass molecules are even more polar than water molecules). You can see this by looking at the image below: the water extends highest where it contacts the edges of the tube, and dips lowest in the middle. The curved surface formed by a liquid in a cylinder or tube is called a meniscus. .."Capillary action occurs because water molecules bond each other strongly due to forces of cohesion and adhesion where water molecules are attracted and stick to other substances such as glass or paper.